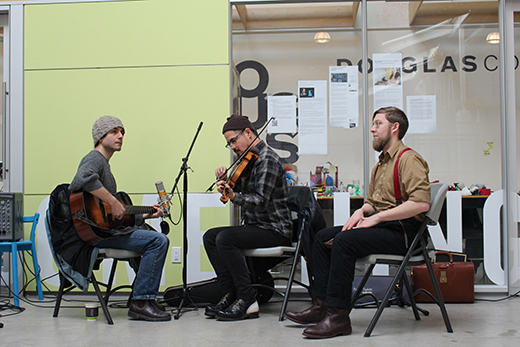 Paul Silveria and his accompanying musicians on banjo and fiddle took no time at all to warm up the crowds at the ArtStarts Gallery and at River Market. Before the workshop even began, families were clapping along to the band's warm-up. Paul started with the basics and had everyone stand in a circle. Partners learned to do-si-do, Allemand, swing, and promenade. Guided by Paul's instructions, the group was swinging each other around to the music. One of the greatest parts of this workshop was that everyone was working together to help remember what all of the steps were. Paul got everyone making funny animal noises and dancing around like octopi to loosen up. Paul stressed that the most important part of square dancing was to have fun, followed by getting all the moves right. The next part of the workshop was a bit more complicated. Partners faced each other in two lines and added to their bank of steps for a Virginia reel. 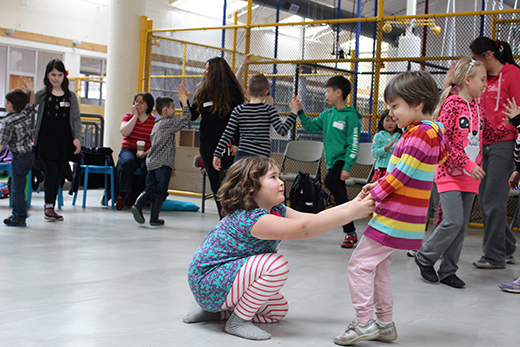 In addition to the do-si-do, Allemande and swing, partners learned a four-step up-and-back, a chassé down and back up the line, and then followed the leader to the back of the line where partners made a bridge for everyone else to run under and back to the front of the line again. New lead partners started each round. Some of the pairs were very mismatched in height with parents and their little ones partnered up. The bridges may have been a little lopsided, but a few of the children were very sweetly up on the tips of their toes. After dancing in a circle, and dancing in a line, Paul wanted the children to dance in, well, a square. 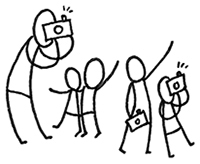 In groups of eight, partners stood side by each and each couple formed one side of the square. Further divided into smalls and talls, and crows and birds, each member of each square got to do a little freestyle in the center of their square before rejoining the square for a promenade. To mix things up at the very end, Paul taught everyone another type of dance—the waltz. Unlike square dancing, which typically follows a 4/4 count, the waltz is a ¾ time tune. 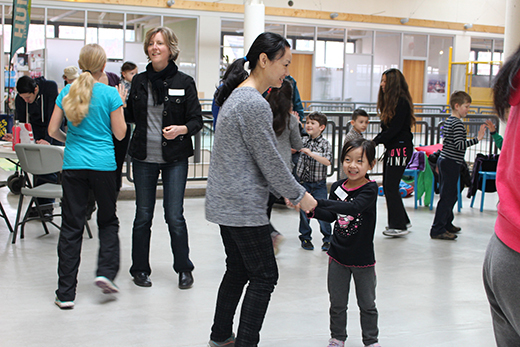 By this time, children and parents alike had picked up the beat and had no problem closing the day’s activity with a freestyle waltz. We saw some new faces on the sidelines at River Market this time around. Drawn in by the music, we had several people stop by to reminisce about the square dances of their teenage years where they met their sweethearts back in the day. It was so lovely to see both young and old take part in a lively tradition. 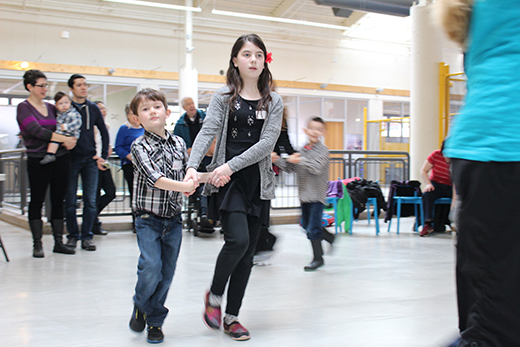 Check out wonderful photos of ArtStarts at River Market in The New Westminster Record. Read more about Paul Silveria and see photos from ArtStarts on Saturdays in the Vancouver Courier. Browse our ArtStarts at River Market Facebook photo album. 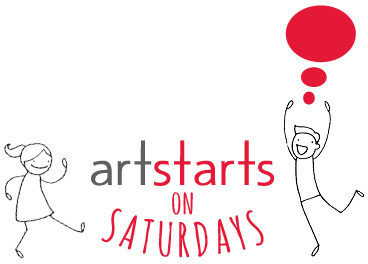 Our ArtStarts on Saturdays Facebook photo album has no new pics this month, since we had a power outage during out the event! We hope to see you soon! Join us at ArtStarts on Saturdays in Vancouver on Saturday, March 26, 2016 and at ArtStarts at River Market in New Westminster on Sunday, March 27, 2016 to explore the exciting, diverse and colourful world of pollen with artist jasna guy. Sessions start at 11am and 1pm. As always, admission is free! See you there! Learn more. 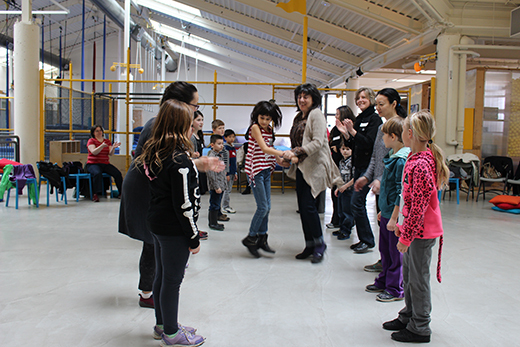 Thanks to Boeing for their generous support of the ArtStarts on Saturdays series. 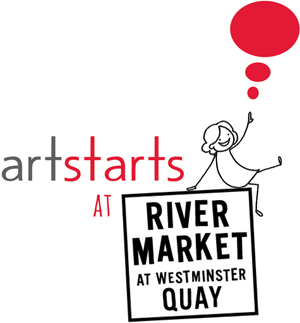 Thanks to Westminster Savings and River Market for their generous support of the ArtStarts at River Market series.